Home Productivity KeepSolid Sign Official Release: Create Your Signature in Our App and Sign Away Documents! Oh boy, we are so excited! The day that we’ve been anticipating for over three years is here at last. 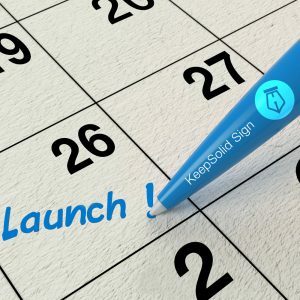 We are delighted to announce that our brainchild KeepSolid Sign finally reaches its official release on the 26th of January after a successfully conducted beta testing. Yippee! What is KeepSolid Sign? Well, if you somehow dodged our previous pieces on this topic, it’s a sophisticated cross-platform app for signing, reviewing, editing, and sending for signing all sorts of contracts. It allows to digitize your document flow, making it more convenient, secured, and effective, sparing your time and resources. The e-Signing functionality of this long-awaited release ensures that your e-Signature needs will be fully satisfied. Check out our KeepSolid Sign official release video below! This project has traveled a long path, bumpy at times, but always exciting and inspiring. Over the course of years, its development team has faced numerous challenges. Overcoming those took them both professional prowess and out-of-the-box solutions. You can read more about this in our article on the history of KeepSolid Sign development. Not long ago, we’ve reached two major milestones. First, we’ve conducted a closed beta test of our product. Over 100 companies from all over the world took part in it. Secondly, we’ve launched a public beta test. Both events proved to be a gold mine of priceless insight, and they became an indispensable experience before an official release. Get KeepSolid Sign and go paperless today! 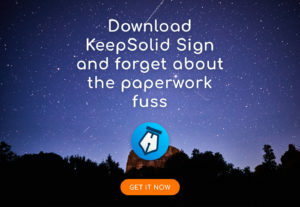 Now, with the official release, KeepSolid Sign is fully armed and ready to take the hassle of your document flow upon itself. As things stand, we are happy to see that users are pleased with our product. We are rated 5 on App Store and 4.6 on Google Play, with an average of 98.7% of crash-free sessions and over a thousand of document drafts. Most of our current users are SMB founders/owners with up to 50 employees. Also, we are officially moving to a paid subscription model – this will help us continue honing our project to perfection. From now on, you will be able to choose the subscription plan that best suits your needs, starting from $6.66 per user per month for an annual Big Team subscription, or $7.99 per month for an annual Personal subscription. You will also be granted a free 14-day trial period (no CC required) and a 7-day guaranteed refund so that you can check out the app for yourself. You can find more information about prices for our app subscription here. Additionally, we have a number of long-term goals that we are yearning to accomplish. Among them, extending the Digital Signature feature to the EU and other countries, adding new supportable document formats, enhancing the UI/UX, and so on. If the sky’s the limit, then we’re building an aircraft here! We hope you will enjoy signing your official documents with KeepSolid Sign. It’s the awesometacular clients like you that keep our wheels spinning and help us shoot for the stars. We’ll be happy to hear what you think about our app and today’s news in the comment section below. Also, please feel free to contact us at [email protected] if you have any questions or suggestions.